Well, it’s that time of the year again when I sit back and wonder where the year has gone and let out an enormous sigh as the doll clothes orders finally start to slow. Yes, as usual I didn’t get as many patterns released this year as I would have hoped and I still haven’t managed to arrange a Christmas holiday in the snow. But I guess that just means that I have some great ideas for pattern releases in 2016 and I still have a ‘White Christmas’ to look forward to (happy face). We have some exciting plans that we have been working on behind the scenes to make the Rosie’s Doll Clothes Patterns website even better in 2016 so hopefully my hubby will have some time off early in the new year to be able to implement them. I can’t wait to share this with you all. Because we will be cycling around Vietnam, staying in villages and sailing around in a tiny Junk boat with only intermittent access to the internet I will not be able to reply to emails received until we get home. I do hope that you understand. 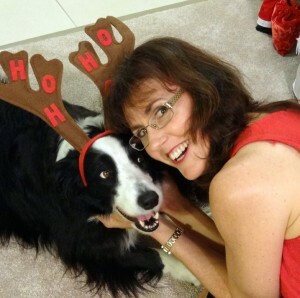 I also hope that my beautiful Bella (the family border collie, or Boodolf as we like to call her at Christmas time) will understand that having someone different move into ‘her’ house while we are away is better than her moving to the kennel. Just a quick reminder that if you’ve been thinking about purchasing my How to Sew Doll Clothes video course now’s the perfect time to do so with a whopping 20% off using the coupon code Christmas20. This offer is valid until December 25th 2015 and will apply to both the online course and DVD set. Wishing you all a wonderful Christmas with your families, safe travels and may 2016 bring you lots of joy, happiness and fun times sewing doll clothes. You and your family have a very Merry Christmas!! Merry Christmas to you and your family. Have a great time on your trip. Wow!!!!! Wishing you and your family a very Merry Christmas and may God be with you on your trip! Have a safe one! Have a great trip Rosie and come back filled with new ideas. Like your dog-we are the “grandparent” to my neighbor’s border collie. They are a great breed, so smart and friendly. Merry Christmas Rosie, and have a wonderful holiday. HAPPY HOLIDAYS to you and family for this season! Annie I just want to thank you for sthe beautiful doll patterns this yr and looing forward to what 2016 has to bring. I wish you and your family a Merry Christmas and a safe journey to Viet Nam see you next year !